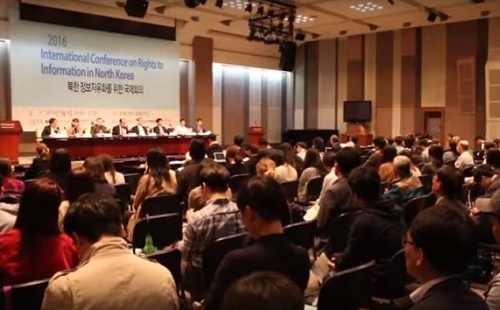 On May 4th at 2pm, ‘International Conference on Rights to Information in North Korea’ was held in the international conference room of Korean Press Center. Kim Young Hwan, a senior researcher of NKnet, said in the keynote speech that “A fundamental solution to current North Korean problems is the elevation of North Korea’s democracy standards, which would hasten the end of North Korean people’s suffering” and for this, the improvement of North Korean people’s consciousness of democracy is necessary. Kim further argued that for this goal, the inflow of objective information that helps North Korean people make wise choice and judgments is integral. In subsequent presentations and debates, Arnold Fang, a researcher for East Asia in Amnesty International, and Jenny Town, an assistant director of the US-Korea Institute at the Johns Hopkins School of Advanced International Studies, explained how North Korean regime controls North Korean citizens’ information inflow and infringes upon their right to information. Nicolai Sprekels, the director of SARAM, a German North Korean human rights group, analyzed North Korea’s current system of information suppression by comparing with Nazi’s counterpart during the WWII. Benedict Rogers, East Asian team leader at Christian Solidarity Worldwide, gave presentation on how the freedom of information influences the freedom of religion, based on his own experiences in Burma and Indonesia. He mentioned a case of an Indonesian youth Alex An, who was imprisoned for 2 years because of his atheism. Alex An confessed that the most difficult thing was the lack of opportunities to access information through such means as books, newspapers, or magazines. Based on this experience, Benedict Rogers emphasized that the freedom of information is essential for the freedom of religion and the freedom of __EXPRESSION__. In following debates, Kang Shin Sam, the chairman of Association of Broadcasting to North Korea was notable for his presentation of real cases in such North Korea-China border cities as Dandong and Guantian and of his own projects in China on the aiding of information inflow in North Korea.